There are many different types of memory and this page is by no means a complete dissertation on the various types of memory you will find in computers or printers. For more detailed information, Kingston Technologies has a lot of very good information. 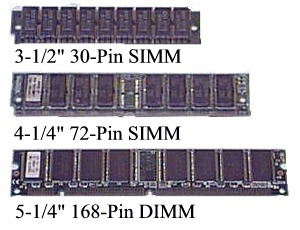 DDR memory is usually designated in one of two ways (i.e. DDR 266MHz or PC2100). This can be confusing if you are someone who does not deal with memory everyday. The table below shows the two naming conventions. The first step in determining what type of memory your system uses is by looking for a manufacturer's part number. The better memory manufacturers will normally attach a label to the memory stick. If there is no label and you have no clue what type of memory you have you can start by measuring the length of the memory. When adding memory to a computer all of the memory needs to be the same speed (i.e. PC133, PC3200, etc..) and have the same CL number (Column Access Strobe Latency i.e. CL2, CL3, etc..) or the computer will be unstable.